(b. 1518, Venezia, d. 1594, Venezia) Click image for more information. In the early fourteenth century, painters were still struggling with how to create visual effects as they tried to paint convincing portrayals of biblical events. Their audience was mostly people who could not read; biblical stories were presented verbally and reinforced visually. By the middle of the fifteenth century artists had overcome technical difficulties and the term “art” had been coined. Half a century later works of exceptional artists were regarded as, “high art.” Patrons had become aware that a painting could depict subject matter and at the same time have visual appeal; Tintoretto, a sixteenth century Venetian artist, excelled in both of these aspects of art. Jacopo Comin’s father worked as a dyer (tintore); thus Jacopo became known by the diminutive term, “Tintoretto.” Very little is known about his childhood and aside from studying briefly with Titian, his skill in art seems to have been learned primarily through his own efforts. Upon deciding on art as a career, he mastered his trade and then at times worked without pay in order to make connections with clients. His aggressiveness made him unpopular with other artists, but it gave him steady work and enabled him to set up a well organized workshop. His many assistants (including his two sons and a daughter) helped complete his large scale commissions. Among his commissions were paintings for the Scuolo Grande di San Rocco, Venice; an institute dedicated to charitable work. Tintoretto was invited to become a member of its brotherhood and in the room called Sala dell’Albergo, he painted four works based on the Passion of Christ. “Christ before Pilate,” is the opening scene. Tintoretto’s mastery of color, light and shadow, foreshortening, and linear perspective are all evident in this painting. The scene’s staging is close to the picture plane; a few feet into the pictorial space and we are front row witnesses to the action taking place. Christ, robed in white, is standing before Pontius Pilate whose face is down and turned aside. Dramatic light is streaming in from behind Pilate and leaving him mostly in shadow. In contrast, the sunlight is shining brilliantly on Christ who is standing motionless. Prior to when this scene took place, Pilate said he found no fault with Christ but the crowd insisted he should be crucified. In a symbolic gesture, Pilate washed his hands in front of the crowd and said, “I am innocent of this man’s blood; see to [the crucifixion] yourselves.” (Matt. 27:24). One of Pilate’s aides is pouring water as he washes his hands. At the feet of Pilate in the foreground is a scribe recording the proceedings with his back to the sunlight. The agitated crowd is in the background and in shadow. 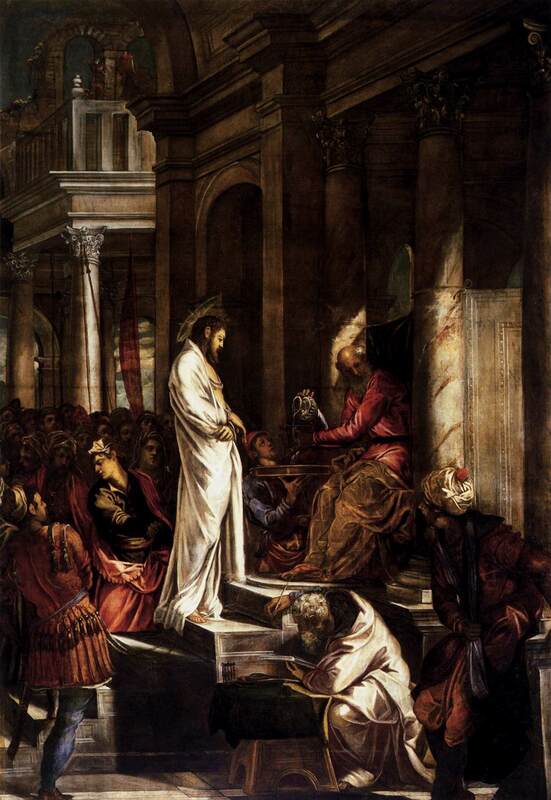 “Christ before Pilate” is a dramatic and convincing portrayal of a biblical event but Tintoretto organizes the visual elements in such a way that it also generates an aesthetic response; “high art” is an apt description.